For the hearing impaired, going to the movies could mean planning your day around the schedule of when theaters screen your selected film with closed captioning. That, or skipping the entire movie-going experience and waiting until the movie comes out in DVD, Blu-Ray, or on cable television. With the new Sony subtitle glasses, theaters may now be able to offer you the technology to screen subtitles right into your peripherals so you can see and hear the exact dialogues in each movie regardless of showtimes. 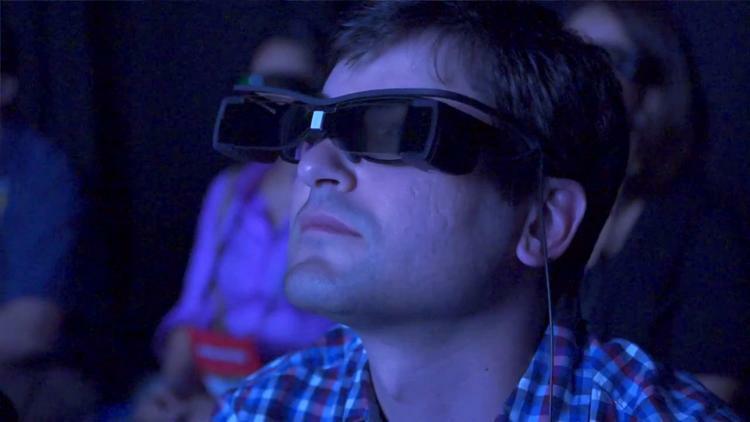 The glasses wear just like any other theater accessory, such as 3D movie glasses, but a projector along the top of the frame will display closed captioning in sync with the film. This effect, according to Sony, will make the subtitles appear as if they are naturally on the screen. Users also have the ability to adjust the size of the letters to fit their reading comfort, and the glasses can be worn on top of your regular glasses if you do not wear contact lens. Formerly a prototype, Sony aims to make this technology available for most major theaters so they can program the subtitles into the glasses beforehand. According to BBC, the United Kingdom may be one of the first markets to receive a trial of the subtitle glasses. No word yet on when the technology will arrive in American movie theaters, but we imagine it won’t be soon after. The necessity to program the dialogues of each movie into the glasses before airing the film might mean similar technology may not yet be available in a home entertainment sector, but if the subtitle glasses gain popularity, you never know. UPDATE: We received an update from Regal Entertainment Groups that by March 2013, the company aims to provide the Sony subtitle glasses in every digital projection shows across the United States. Regal has already begun distributing these in some showings, and the feedback from customers have been extremely positive. Now you know where you can find your subtitle glasses at the next showing of a movie! Watch the video of a Sony subtitle glasses demonstration below.